"No, go find your own." 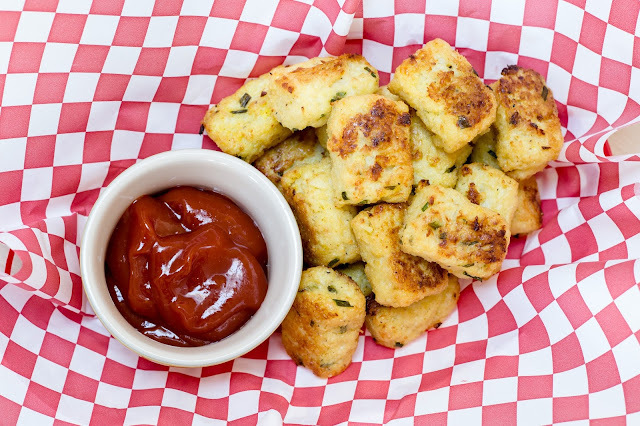 I'm calling these "veggie tots" because you can pretty much make these with any veggie. I made them with cauliflower to mimic the look of their potato cousins, but you could also try broccoli or sweet potatoes. 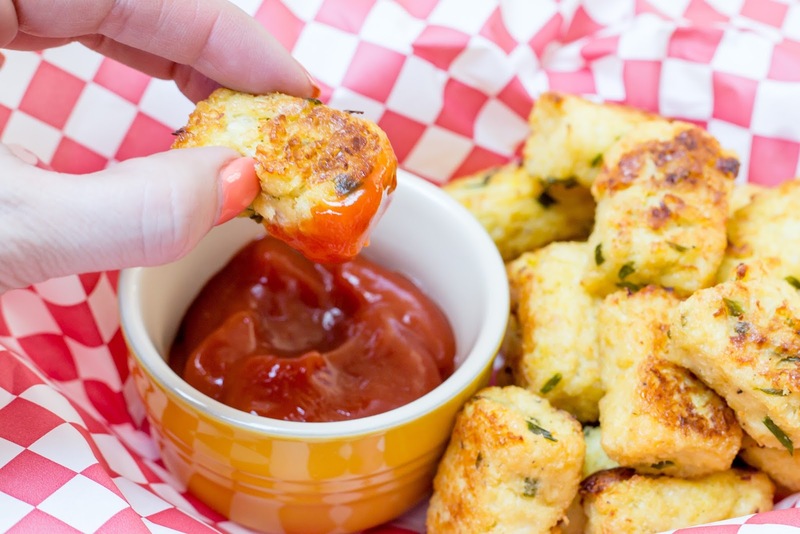 Now, will they exactly mimic tater tots? No, I can't promise that. 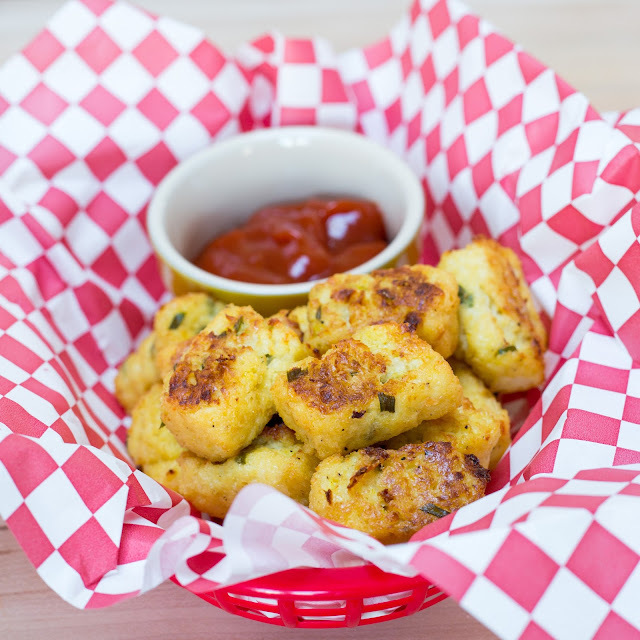 But they will provide you a much healthier and lower carb snack by subbing cauliflower and baking in the oven. 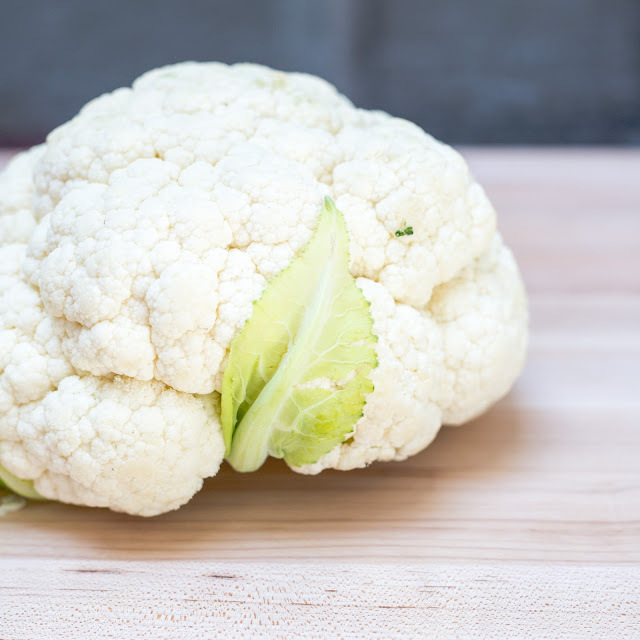 Cauliflower isn't as beneficial as, say, broccoli, but it is still a great source of vitamin C, vitamin K, dietary fiber, and omega-3 fatty acids. It's also low in calories and has a low glycemic index (aka: low in carbs.) For example, a regular white potato has about 15 grams of carbs in a 1/2 cup, while the same serving of cauliflower has just 2.5 grams of carbohydrates. Cut the cauliflower into florets and quickly boil or steam until soft (usually about 5-7 minutes), drain well and return to the warm pot and heat over low heat for another minute or so (this will help "dry out" the cauliflower as you need as much as the water removed as possible.) Transfer to the bowl of a food processor fitted with the metal blade and pulse until it looks like "rice" (this won't take very long). I kinda got lazy with this the first time I made these, so I'm going to emphasize to you that you want the cauliflower as dry as possible. If it still seems wet, I would recommend placing the cauliflower rice in a clean dishcloth or cheesecloth and squeezing out any remaining moisture. From here, you can make you mixture. 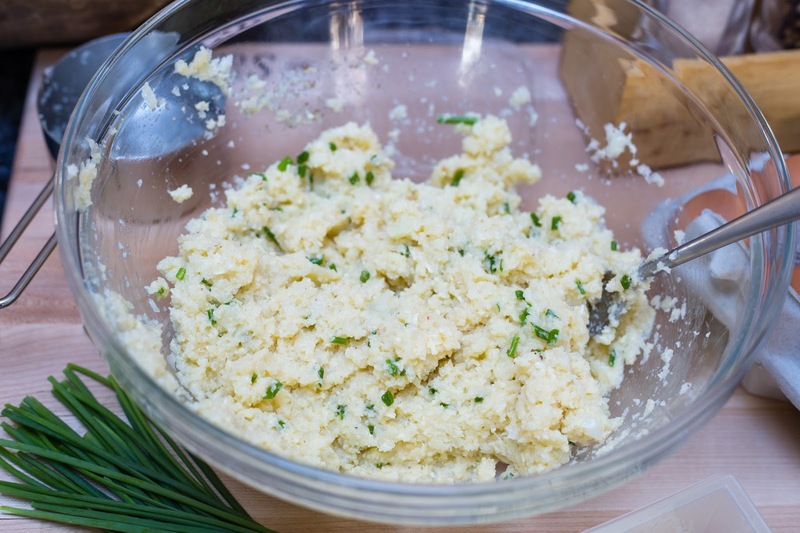 Put 2 cups of the cauliflower rice in a bowl (you may have leftovers*) and add to it: 1 egg + 1 egg white (slightly beaten), 1/2 cup panko, 1/3 grated Parmesan cheese, 1/3 finely grated pepper jack cheese (optional), 1-2 tablespoon snipped chives, and salt and pepper to taste. 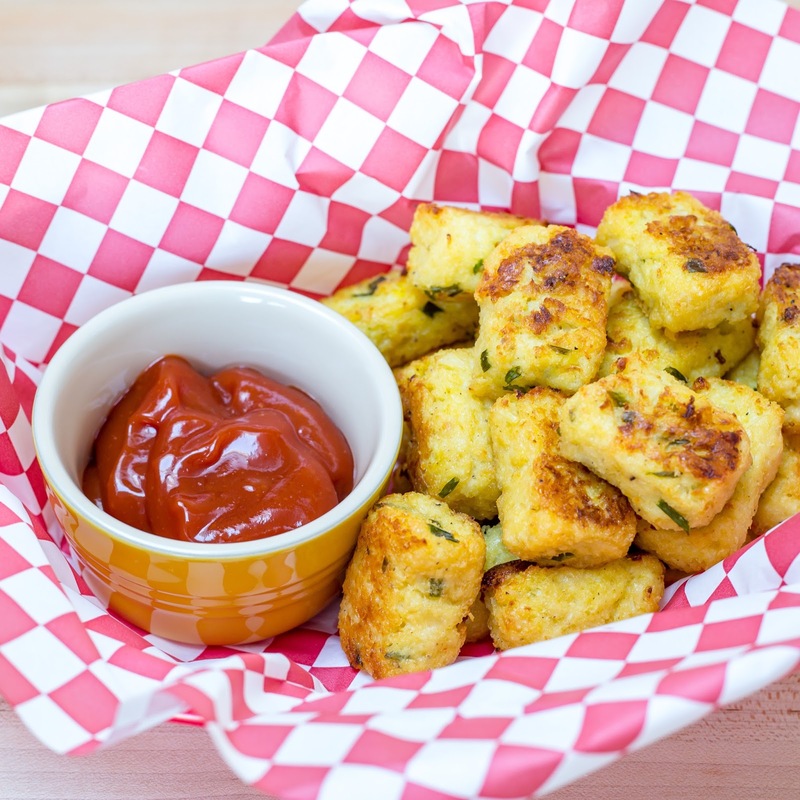 *You can use leftovers for another batch of tots, or make it into faux mashed potatoes or the base for a cauliflower pizza crust. Scoop out about a tablespoon or so of the mixture and form into little tots with oiled fingers. Place them on a baking sheet lined with either foil and sprayed with cooking spray OR parchment paper. I used foil the first time, but I'm wondering if parchment paper would be better to avoid sticking. Depending on how big you make your tots, you should end up with about 30 pieces. Brush each with a little olive oil and bake at 350 degrees until lightly browned, turning and re-brushing with oil about halfway through. Cooking time will vary depending on how much moisture was remaining in the cauliflower and how big you make them. Mine took around 35-40 minutes total, so I flipped after about 20. But just to be safe, I would check them every 10 minutes. I ate mine with a kicked-up ketchup made with Simply Heinz ketchup (no HFC), Sriracha and a touch of honey. 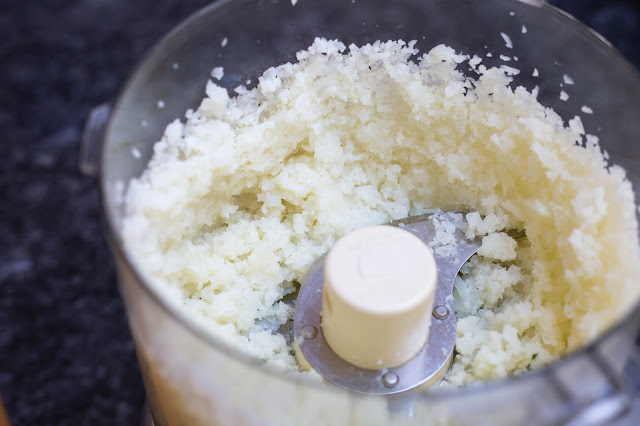 Transfer to the bowl of a food processor fitted with the metal blade and pulse until it looks like "rice" (this won't take very long, take care not to puree it). If the cauliflower still seems too "wet," place in a clean dishcloth or cheesecloth and squeezing out any remaining moisture. Put 2 cups of the cauliflower rice in a bowl (you may have leftovers) and add to it: 1 egg (slightly beaten), 1/2 cup panko, 1/3 grated Parmesan cheese, 1/3 finely grated pepper jack cheese (optional), 1-2 tablespoon snipped chives, and salt and pepper to taste. Scoop out about a tablespoon or so of the mixture and form into little tots with oiled fingers. 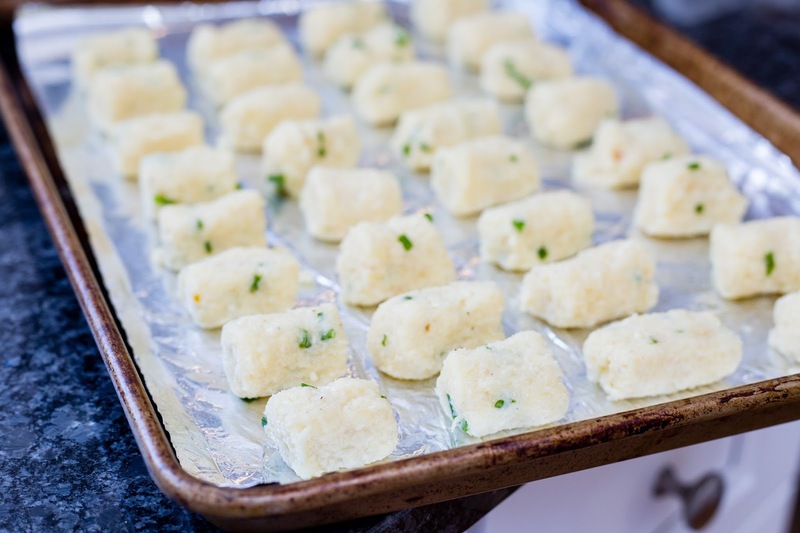 Place them on a baking sheet lined with either foil and sprayed with cooking spray OR parchment paper. Brush each with a little olive oil and bake until lightly browned, carefully turning and re-brushing with oil about halfway through. **Cooking time will vary depending on how much moisture was remaining in the cauliflower and how big you make them. I would estimate between 20-40 minutes, but check them every 10 minutes. Allow to cool slightly and serve with your favorite dipping sauce. You're really a great talent and I thoroughly enjoy this blog. So much more than a SC personality. Eating my oatmeal in the morning with my boys (10 and 13) enjoying the chemistry and fun you guys seemed to be having on SCam will be missed almost too much. I hope this finds you well and if not I understand. You're loved and admired. Bathe yourself in the love of family and friends. We will await your next adventure. Sending our love from Boerne Texas. Hi Jaymee, just saw you on Beat Bobby Flat and came here to read your blog. If I wanted to make sweet potato tots what would you recommend? Steaming then ricing? Thanks for your help! HI Beth! So sorry for the late reply. I would almost roast them. You want them to be on the drier side before making the tot mixture or they won't get crispy. Let me know how they turn out! !